Many of the long-term unemployed in our country are in a prison–a financial prison–and while there are no visible bars for others to see, the prison cell is every bit as real and as confining. I know as I’ve been there for over three years now. Yet, I’ve seen how God has provided for me. And I’ve experienced over and over again the power of praise when the frustration of my circumstances feels overwhelming and never-ending. Praise pulls us out of the pit of despair and turns our focus back on God, who alone knows why the answer hasn’t come yet. It’s hard to see beyond our own immediate circumstances, but God sees the whole picture and all that it encompasses including all of the other lives it affects that we know nothing about. Adversity is a chance to praise God for what He is doing in our lives through the adversity and in the lives of others we come into contact with (e.g., in Paul’s case, the Philippian jailer). Praise is powerful in taking our focus off of ourselves and our immediate situation and quieting the desperation we feel especially when it feels like our trial will never end. It puts hope back in our hearts knowing that God is quite capable of changing everything in a moment–but it has to be His moment and His timing. As Christians, no matter how dark our circumstances or how long lasting the trial may be, we are instructed to “Be joyful always; pray continually; give thanks in all circumstances, for this is God’s will for you in Christ Jesus” (I Thess. 5:16-18). So let’s praise Him for who He is, and leave our circumstances in His hands even though I personally know how incredibly hard it is to do that when it has gone on for so very, very, very long. He is our faithful God. I say this to myself as much as I say it to you as after over three years of unemployment I need to be reminded to do that, too, on a daily basis. 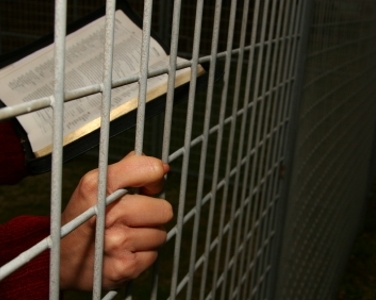 Being in prison for something you did not do is not an ideal situation, but Paul found a way to make it a place of praise. Most people would have been questioning why they were there, wondering if living for Christ was really the right decision. Who would want this type of abuse? However, Paul understood the power that rested within the God he served. He knew that despite the gravity of his circumstances, God could change everything in a moment. So instead of waiting until after God delivered him to sing praises, Paul took the first step. He and Silas began crooning praises to God. Then the foundations of the prison shook.